Changing the world one extremely tasty pizza slice at a time. Another craft we love at Rocky Mountain Flatbread are these handmade holiday crackers. You can use anything as your base but one of our favourite options is to use toilet paper rolls ­– a little bit of recycling and a lot of crafting! You can take the time to write out jokes, or personalized messages and pop them into the toilet roll before you wrap up the cracker. Additionally, you could pop a little prize or two in the toilet roll before you wrap it up for even more excitement when you pull them apart! These holiday crackers are a great way to wrap up little gifts (like lip balms or hand creams) as well! Find a suitable base, we like to use toilet rolls. Write out a joke, or personalized message and slide it inside the toilet roll with the popping part of the cracker. Choose your wrapping paper, cut to size (you want the paper to be about 6 inches bigger than the base is long so you have a 3 inch overhang on each side) and roll your cracker up. Once the paper is secured in place around the toilet paper roll (we like double sided tape for this), tie the cracker up on either side of the toilet paper roll using your favourite ribbon or twine. Ensure the popper is centred in the roll and anchor the ends down to the wrapping paper with double sided tape. Decorate the outside of the cracker however you like. We hope you have a chance to try making your own crackers this holiday season. Good luck and happy crafting! Tagged Holiday Crackers, Holiday Crafting, Rocky Mountain Flatbread Co.
Crafting continues at Rocky Mountain Flatbread with Holiday Bunting Flags! What better way to decorate than with bunting flags. 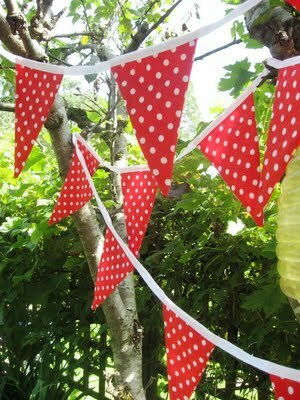 And these aren’t your run of the mill plastic bunting flags! Have fun choosing the fabrics at the craft store, or make them with recycled scrap fabrics you have at home! Basic steps include: cutting out triangle shaped pieces of fabric, sewing them rights sides together along the two longer edges and then turning the fabric right sides out. Iron your fabric and then sandwich the flags between some brightly coloured folded bias tape. Pin in place and then stitch alond the edge of the bias tape. Hang around your house or even on your holiday tree. For more in depth details follow this clear and excellent tutorial from Sew In Love. You could even take it one step further and cut out some felt letters and add a happy message! Image courtesy of Great Little Trading Co.
At Rocky Mountain Flatbread we are joining the handmade revolution this holiday season! Over the next few weeks we will share with you some of our favourite handmade holiday gifts, green gift ideas and fun crafty projects. Today we are featuring homemade advent calendars! Here is a great easy craft we found from Country Living. Use ordinary grocery-store matchboxes to count down the days till Christmas. Just hot-glue the tops of empty boxes to one another to form rows (start with nine boxes for the base, and decrease by two until you have a single box). Cut wrapping paper to cover each section; secure with hot glue. Next, hot-glue the rows in a pyramid shape as shown. 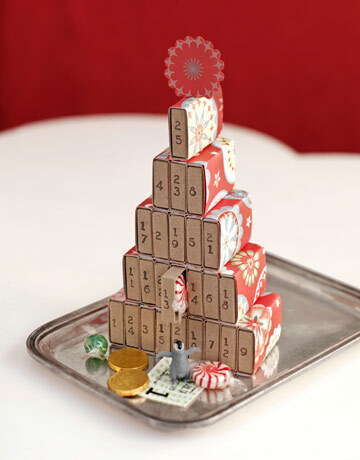 Use number stamps (available at craft stores) to mark the boxes 1 through 25, then fill with candy and trinkets.